The rot beneath the fragile bureaucratic fabric of our country tends converge upon the society's weakest links, suffocating them until they might as well not exist. But there are always those who break the mold, so to speak. Minugurulu breaks it both within itself and without. Raju (Deepak Saroj) is a bright young boy with aspirations of filmmaking. His world revolves around showing people the world as he sees it. Then, in a meaningless tragedy, he loses his sight. Circumstances converge upon him further, and his dismal world is now a home for blind children run by Narayan (Ashish Vidhyarthi), a man whose sole aim in life is milking his hapless wards of all they are worth. While the kids already there are pretty much resigned to the status quo, Raju cannot be so. He still dreams, and will move heaven, earth and Narayan's degenerate behind to ensure they come true. Minugurulu comes very close to being your average underdog survival tale. It transcends that theme by virtue of the filmmaker's vision alone - clinical yet sympathetic, like a surgeon cutting through living flesh to expose the disease within, only to work to the best of his / her abilities to get rid of it. Krishnamshetty uses the camera, the wonderful children, the setting and every resource available to him to move you, to unsettle you, to interest you, and to have you emote anything and everything but indifference. He succeeds quite spectacularly. If you've read anything about the movie, you probably know that the major premise is that the wonderful, brave, resourceful children shoot a film about their lives. While many a film has given the underdog an impossible task, filmmakers have a tendency to hide behind our sympathy for the character when it comes to how the task is accomplished. Pity is the farthest of emotions these children evoke. You emphasize with them not because you pity them. You root for them because these are great kids and you genuinely want them, rather than a nameless, faceless mass of unfortunate children, to win. Even more importantly, Krishnamshetty brusquely brushes aside your awe at the magnitude of the task before our little heroes. He then sets about showing us how they do it in plausible and immense detail. Meanwhile, his own camera is obviously sentient. It becomes the eye of whoever the POV belongs to. Narayan's world is a dank treasure chest up for grabs. Raju's is one that is going through the intense struggle of coming to terms with the fact that no light will ever shine on it. The actors are nothing short of brilliant. The kid, Deepak, will make you want to knock on the doors of hell in your quest to get him anything he wants. The rest of the kids were just as good. Not one of them overacts, and not one of the characters demands more than is due to them. Vidhyarthi has always been good at being bad. This time, though, he's outdone himself at heartlessness and shamelessness. This is a character with so many nuances of bad, that the times when he's being less evil can be confused with goodness. Stockholm Syndrome, this is called, we believe. 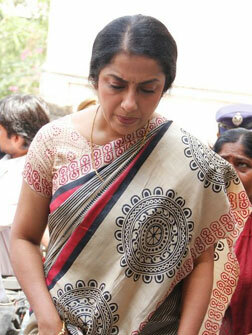 We wish we could've seen more of the utterly gorgeous Suhasini. No such luck. She has a tiny part, and is on screen for all of 5 minutes. story in a way that will break your heart while making it stronger. It gives you all the strife and humour and "action and "romance" you might want, while taking away your ability to distance yourself from what's happening. If you'd still rather go in for imported bims and CG struggles, then you deserve the drivel our "mass" filmmakers try to pass off as cinema. P.S. : Although Minugurulu has been nominated for the international children's film festival, we hesitate to recommend it as appropriate for children to watch. While the violence is still okay, the language is a bit unnecessarily crass at times, and there is a bit too much sexual content for anyone under the age of 15 to watch it. Also add: Apparao, Paramesh Also, actor Srinivas Sai (of "Golconda High School") is wrongly credited in the film as "Sai Srinivas". excellent movie.... a welcome relief from mass masala movies, and yet so entertaining. the second half was especially interesting. novel idea, perfect execution, good performances. only 2-3 scenes were boring. fullhyd.com has 700,000+ monthly visits. Tell Hyderabad what you feel about Minugurulu!